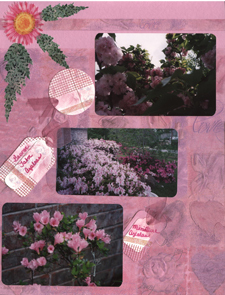 One of the nicest things about Floral or Flower Scrapbook Layouts is the fact that you can crop your photos to fit your layouts and you don't have to be concerned that you will cut off too much. I like the fact also that they are always eager to pose for the camera. 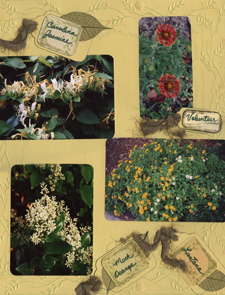 These two Flower Scrapbook Layouts use all items from a the January 2011 Personal Shopper Scrapbook Kit. I like using Kits as all the products match color-wise and they give me a chance to do some layouts that look a little different from my usual. The Background Paper has a corner floral rose print on a base of what looks like text printed in columns. With these corner floral prints, I have turned the backgrounds so that the roses flow from the left to the right pages. This makes the text upside down on one page, but it is not noticeable in the finished product. This is strictly a matter of personal preference. All photos were double matted using a pink dotted paper from the kit and an Ivory card stock from my stash. The Ivory mattes were edged with a Pink ink that came with the kit. 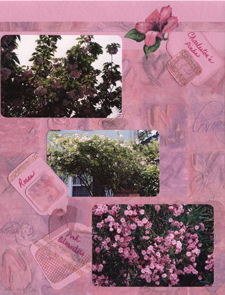 Other embellishments for these Flower Scrapbook Layouts include a ribbon of Net Roses in White & Pink with the white ones enhanced with the Pink ink and Letter Tiles on the right page as the Title, Hampton Park. 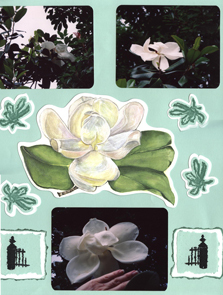 Each of the Magnolia stamps is stamped on the same green card stock as the background, then cut out leaving a small border. These were double mounted onto white card stock which is then cut out again leaving a small white border. The Fence Post stamp is done the same way, but both mattes are torn and the white matte has the edges inked in a darker green ink. 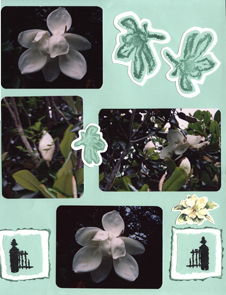 This layout was significant to me and my mother as we had planted the Magnolia tree years before when it was only 5 inches high. These were the first blooms and they were about 8 inches in diameter. Gorgeous success. One of the themes through these Floral Scarpbook Layouts is the fact that each of the flowers photographed in the 2-page spreads was the same color. These on the pink card stock background were all pink. 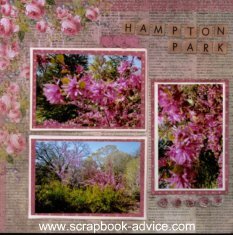 The main embellishments on these pages are printed floral designs on vellum paper and tags made from scraps of pink and white card stock. The tags are further embellished with cut outs from the Club Scrap Wedding Kit, pink metallic ribbon from my stash of ribbons, a little bit of Pink Magic Mesh and Pink Organza Ribbon through the holes in the tags. Each tag is a little different in shape and design and has the name of the flower hand written in pink and one has the Title, "Charleston Pink's." 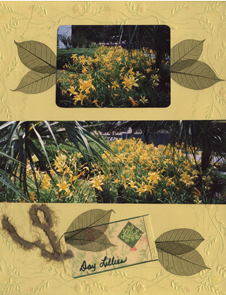 These Floral Scrapbook Layouts are all yellow flowers. The embellishments here are more tags with green fuzzy fibers containing the names of the flowers. 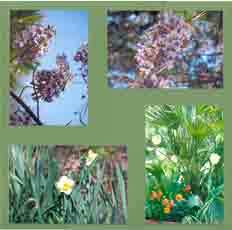 One tag uses a the thumbnail photo of one of the garden plantings. Also used are green stitched leaves that are available in many different colors from many craft and local scrapbook stores. These are used on and under the tags as well as alone on the background. Papers, cut outs and fibers are all from the Club Scrap kit Aromatherapy. The background paper here is yellow with pale green floral & vine designs embossed. 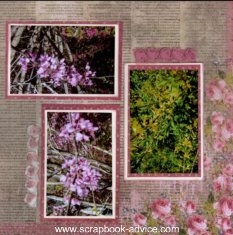 These Floral Scrapbook Layouts used the photos un-cropped with no embellishments at all - the photos just speak for themselves. 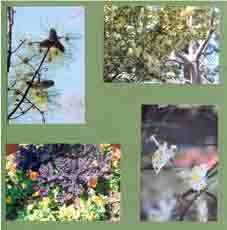 This worked out well using the "four corners" layout because four photos were horizontal and four were vertical. This was actually planned when taking the photos. While this above layout is very, very simple, is uses a sketch that I use quite often. Check out our page on Sketches & Titles to see some other layouts using this same sketch and more embellishments.